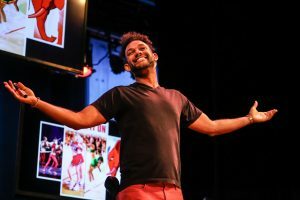 THE DAY I BECAME BLACK is currently running at The SoHo Playhouse to great acclaim and is created, written and performed by Bill Posley (CBS’s “The Neighborhood,” Netflix’s “Glow”) and directed by Bente Engelstoft (“The Ellen DeGeneres Show”). Can you pinpoint the day, hour, month, moment when you became black? I can, but you have to see the show for that. Where do you draw inspiration from for your particular brand of comedy? Dave Chapelle is a huge inspiration of mine. His stand up taught me that comedy can be meaningful and say something, and that sometimes when the audience is laughing, they didn’t get the heart of the joke. It doesn’t matter how well crafted, clever, meaningful or sophisticated the best joke in the world is. It will never make me laugh as much as a well-placed fart noise. I know that it’s pathetic, but it’s true. Who are your favorite comedians at the moment? You have stated that “we’ve all been forced to identify with something that didn’t feel quite right”. Can you give me an example of the most ludicrous attempt on your part to try and “fit in”? Yes! I emptied a Costco sized tube of gel trying to spike my curly so I could be like my white cousins. My eyes still burn from me sweating all the gel down my face. As I ran around playing with them. “The population of multi-racial people is growing three times faster than the population as a whole.” Tell us what you think our multi-racial universe will look like in the future. With multi-racial people in the power seat, what positive changes can we expect? I was scared, drunk and dressed in a Spiderman onesie, trying to get through my first open mic set. You literally hold up a magical mirror before the show so audience members can “Become Bill Posley”. Tell us a little about what transformation the brave souls who enter will experience? The opportunity to sit and look at someone who doesn’t look like them for a moment. Not just see them in passing, or be next to them in a waiting room but actually look at them is incredible and something we don’t always do in our day to day lives…”Make A Connection” What each person takes from it is their experience, but I know for a fact that there has been a lot of smiles and a lot of love. There has even been some cathartic crying. You served in the US military. How has that journey fed into your life as an artist? The moment I realized that I wanted to be a comedian/storyteller was when I was stationed in Iraq. While we were overseas we literally had nothing but stories. When I shared my stories I would make people laugh. I would make them forget about the fact that we were at war far away from our families and our friends. Comedy has the ability to transcend and transform a person’s situation and their mindset. Comedy is how I got through that experience of being in Iraq. I had a sergeant sit me down while we were over there and said, “I don’t know what you plan on doing with the rest your life but comedy should be a part of it,” and that was it, I knew what I wanted to do. What are some of your fav spots/experiences/people in New York that you wish you had back in L.A? The amount of live shows! I wish there were this many live shows to go see every day in LA. This place is amazing for that. And most importantly I wish LA’s diner game was as on point. We need get some better diners out there. If you were an audience member trying to convince your friends to join you at “The Day I Became Black” – what would your elevator pitch be to get them to come along for the ride? Come see a show that makes you change the way you think about identity forever… And if you don’t see it then everyone will think you’re a racist. Future plans? what can we expect to see you in for the rest of 2019? One of my future plans is to do another one-man show around my time in the military called “The Day I Joined The Army.” I would like to continue to take complex subject matter and make it more relatable to audiences. I want to “tickle the ribs to inject the medicine” as they say. 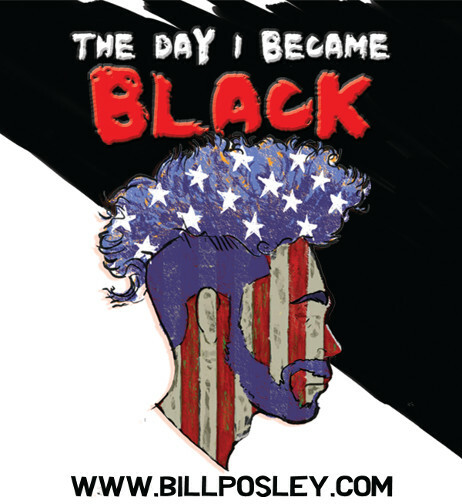 Nominated for Best Solo Show and Top of the Fringe at the 2018 Hollywood Fringe Festival, THE DAY I BECAME BLACK tackles these themes not just through a Black lens, but through a Biracial one as well. The population of multi-racial people is growing three times faster than the population as a whole. We’ve all been forced to identify with something that didn’t feel quite right. This show finds the comedy in the struggle of trying to fit in and trying to just be yourself. The Soho Playhouse is located at 15 Vandam Street between 6th Avenue and Varick Street in New York City. Performances are Thursdays – Saturdays at 7pm, Sundays at 3pm and Mondays at 9pm. The Sunday, April 21 show is at 8pm. Ages 18+. Tickets are $39. Purchase at https://www.BillPosley.com or by calling 1-888-596-1027. The running time is 70 minutes. For more info visit https://www.sohoplayhouse.com/the-day-i-became-black. Like THE DAY I BECAME BLACK at https://www.facebook.com/thedayibecameblack, follow on Twitter at https://twitter.com/billposley, and on Instagram at https://www.instagram.com/thedayibecameblack and https://www.instagram.com/billposley.